Enjoy what is truly an outdoorsman's paradise, with activities you won't find anywhere else. Go for a ride in an off-road vehicle, kayaking, hiking, nature watching, flightseeing, ziplining and more. Set amidst the peaceful forest, the park is home to 14 totem poles, each telling their own story, and a replica of a 19th-century clan house, offering a look into the Tlingit and Haida Native Alaskan cultures. Experience the rich living culture of the Tlingits as they welcome you to their village. Unravel totem pole mysteries, see carvers in action, shop for fine art and enter a clan house to watch Native dancers. This 40-acre rainforest reserve is home to bald eagles, black bear, seals and a variety of birds, a live eagle display and a master Native totem pole carver at work. Take in the dramatic beauty of a land slowly crafted by the hands of nature. It encompasses more than two million acres of sheer granite cliffs, 1,000-foot waterfalls, and crystalline lakes. This celebration of a bygone era is a rip-roaring good time. World champion athletes compete in springboard chopping, buck sawing, axe throwing, log rolling and the thrilling 50-foot tree climb. A former cannery bunkhouse built in the 1940s, this historic lodge was towed on a log raft over 70 miles to its current site on the shores of the spectacular George Inlet waterway 15 miles south of Ketchikan. This historic boardwalk was a Red Light District during the Gold Rush. 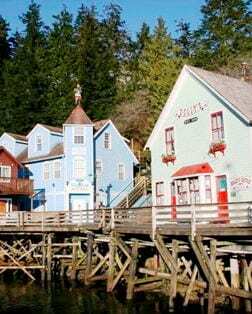 Now, it's a quaint place to tour Dolly's House museum, view totem poles, and shop at locally owned stores and galleries.